The history of textiles is largely a history of increasing complexity and human expression. Textiles, broadly defined, have been with us for well over 100,000 years. We use the term to describe any of the fabric arts integral to both the culture and survival of human populations. Textiles were developed both independently and through trade. In the first case, bands of humans unaware of one another’s existence discovered the same methods and styles many hundreds of times over in a kind of convergent historic evolution; they used materials as various as wool, cotton, and silk, and employed multiple unwoven, flat-weave and piled-weave techniques. 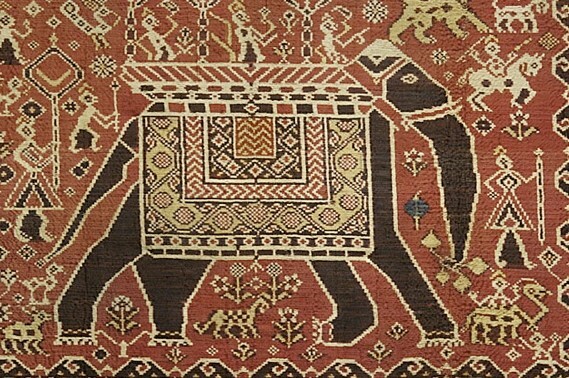 In the second case, textiles and production methods evolved by cross-cultural trade, as methods, materials, and local designs passed between people and generations. The history of textiles is largely a history of increasing complexity: the earliest textiles likely took the form of rudimentary blankets made of felt, a simple fabric made by pressing fibers closely together. Then, with the advent of spun fiber, they make a giant creative leap forward: yarns being woven together to create the first truly complex designs. We find the earliest evidence of weaving in Peru dating to about 8,000 BC, and this new technology, spreading globally, subsequently ushers in a long development of the art. 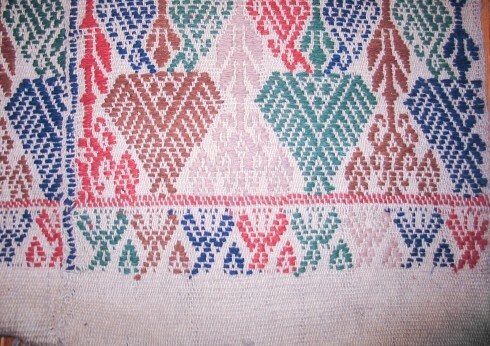 The first woven textiles are flat weave forms such as tapestry, the Kilim, and the Samouk. Later, we see the development of knotted-pile textiles, the first examples likely woven by tribes in Siberia. This innovation—the hand-knotted addition of pile to the woven warp and weft—opens the floodgates to the centuries-long history of complex textile art that follows. It seems that every textile form, at least in its initial development, is born out of circumstance. It’s not only the textiles of the late stone age that were created primarily for warmth; even the first highly decorative, intricately designed knotted pile textiles of Siberia were originally made as blankets. Most likely, they were woven as an early kind of renewable resource: a replacement for traditional animal hides that inconveniently required butchering the source. To point out the utilitarian origin of textiles is not to demote their essential art; it is only to point out how inextricably linked the two elements of design—art and utility—truly are. Our notion of some essential separation between the two is, in fact, quite modern. Perhaps the most astonishing characteristic of the textile arts is how little the ancient manufacturing methods and forms have changed over the years. Today, among the many antique textiles finding their way onto the international market, there are saddle blankets, tribal bags, bedding, tapestries, and table covers made according to centuries-old tradition. 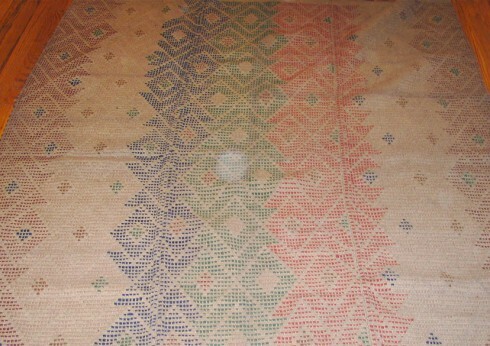 Each utilitarian form holds in its weave the unique aesthetic of its weaver, and more and more this artistic value is being recognized. Particularly when it comes to high examples of the 17th through 19th centuries, many extremely beautiful forms have begun to develop collector and decorative markets all their own.